Going on safari does not mean you need to sacrifice comfort and service. On the contrary, we are highly confident you will be blown away by most of the safari camps and lodges in our portfolio and guarantee you will be spoiled by the highly personalised service we offer. All rooms and luxury 'tents' in our portfolio were designed to allow guests to experience every comfort while maintaining a wild ambience and blending in with the natural surroundings. All the safari lodges and tented camps we use are tastefully decorated and many of them offer first class accommodation and hosting on par or superior to the service and amenities of the likes of Amanresorts or Four Seasons properties most Asians are familiar with. Whether you choose to explore Africa via one of our tailor-made safaris or join one of our special interest safaris, there are three levels of luxury to be enjoyed. Our Ultra-luxe collection of unique camps comprises of exclusive five-star safari accommodation in the finest wildlife viewing areas in Africa. These camps have extra large bedrooms and bathrooms, usually with separate lounge areas and expansive outdoor 'salas', verandahs and private plunge pools. Our Luxury camps are hand-picked tented camps and lodges offering superb accommodation and facilities with some of the highest staff to guest ratios in the world. These safari camps and lodges are also located in the most wildlife prolific wilderness areas (often in private reserves and concessions) and you will enjoy the company of some of Africa's top safari guides. Our charming mobile camps are more rustic (because these camps need to be moved regularly to follow migrating wildlife) but do not sacrifice comfort, service, safety and character. 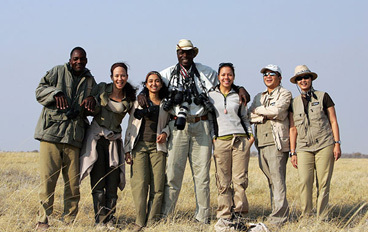 These traditional safari camps are intimate, as they usually accommodate fewer guests, and offer very personal service. Each camp is set up to take advantage of game movements - such as the wildebeest migration in Tanzania or Kenya, elephant and other big game concentrations in Botswana, Namibia and Zimbabwe - and are located in stunning private areas. What are safari tents and rooms like? All rooms are fitted with large deluxe beds (with duvets), adjoining en-suite bathrooms with flush toilets, basins, showers with hot and cold running water and good lighting. There is always a fresh supply of clean towels, face cloths, bath robes and eco-friendly soap, shampoo and body lotion. Many camps have additional outdoor showers or baths for those who want to shower amid endless vistas or bathe under the stars. Staying at a Ultra-luxe safari camp or lodge provides guests with all the finest amenities of a top-notch city hotel but in a totally wild and natural setting. Most Ultra-luxe camps have extra large rooms or walk-in tents (most often larger than 5-star hotel suites) with wooden doors. Walls are made of thick canvas with large windows for viewing wildlife. In addition to the amenities provided at standard rooms, you will enjoy a large king or queen bed with premium pillows, rich linens, duvet, side tables, dressing table, wardrobe, Persian or sisal carpets and other chic and luxurious features. Our comfortable mobile tents provide the ultimate and authentic bush experience. These sturdy canvas tents with private verandahs are fitted with deluxe beds (with duvets, blankets and hot water bottles during the cooler months), en-suite toilets (usually eco-flush), basins, old-style bucket showers with hot and cold water and good lighting (with hurricane lanterns out front). There is always a fresh supply of clean towels, face cloths and organic, eco-friendly soap, shampoo and body lotion. All the safari camps are sprayed regularly with environmentally-friendly mosquito repellent. Our partners have a remarkably good track record in this regard. Other amenities include mosquito netting, oil or rechargeable lamps and torches, purified or bottled mineral water, bug spray, wardrobes and desks with writing materials. You will definitely not be roughing it.